Last weekend I golfed my first 9 holes of the season. My husband really wanted to play, and although I was feeling kinda sick and wearing 2 jackets and a toque I agreed to get out and swing the clubs. Much to my surprise and delight my shots where straight, my drives went long and my short game was better than usual. Plus I had no pain in my back. What is happening?????? After analyzing my play I recognized that I was hitting the ball from a place of good hip and core stability, with a slow back swing and smooth rotation. This gave me the foundation to then transfer power and bring the club face through to impact the ball squarely. A required element of the game if you don't want to be looking for your ball in the rough and the trees all the time! Plus I was visualizing where I wanted to see my shot go. I saw the loft of the ball and the distance and goal I was aiming for in my minds eye before I swung the club. I saw my shot succeed before I made it, and mostly it went where I had mentally practiced! This was a great first game of the season (early April!) and I am feeling hopeful that my play will continue to improve over the course of the summer. Maybe I'll even learn to love this game. And of course I KNOW that the elements to a great golf game ARE the essence of what PILATES offers its practitioner, - core strength, balance, shoulder function, hip function, coordination, control, mindful intention. PILATES makes all your movement patterns easier with flexible strength and good body awareness. It will take your sports performances to a whole other level. And for a such a dynamic and difficult movement like swinging a golf club with accuracy and ease, I'll take all the help I can get. FORE!! There is a line from the wonderful book, 'Alice in Wonderland" when Alice comes to a fork in the road and asks the Cheshire Cat which fork she should take? Ah yes! To get to our goal, our destination, our desire we must first know WHAT IT IS we wish to achieve, receive or experience...... and then we must TAKE STEPS, one at a time, IN THAT DIRECTION to move ourselves gradually closer to our heart's desire. 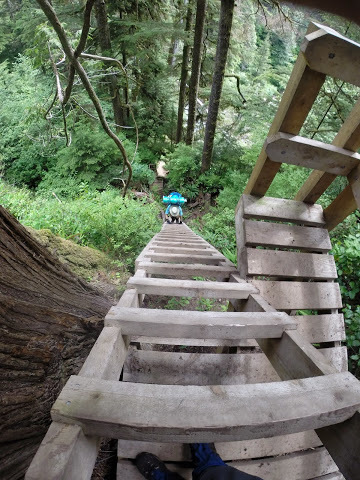 In this photo I am climbing a very steep, very high ladder from the lush forest floor to a ridge high above, along the famous West Coast Trail, with a 40 lb pack on my back. The 5 day camping/hiking trip was arduous and challenging and beautiful and awesome! This ladder was a required part of the journey to move us through the rugged terrain. I knew exactly which direction I needed to go, UP! Slowly, step by step, this ladder would take me closer to my goal of successfully completing the full WCT. So for this New Year of 2019 - Where Do You Want To Get To? And how do you want to live in your body? What steps can you take to get you on the right path and help move you toward your destination? Be it less pain, more balance, ease of movement and better posture. Or perhaps a healthy, mobile body for traveling, taking up a new sport, joining a league, learning to play an instrument? How do you want to feel? Stable, confident and resilient, or tight, stressed and weak? What steps can you take to move you toward your 2019 goals? I have a suggestion: PILATES! Ah Christmas time....I love this time of year. The decorations, twinkling lights, Christmas movies and music...plus the ski season is starting! Let it snow! I love it all. But the calories will kill you! The holiday baking, parties, dinners and treats add up, and up and up. Do you have a plan to help you stay healthy and active over the Holiday Season this year? Unless you have a no-brainer way to stay true to your sanity and your health over the Juletide, it is easy to fall prey to the indulgences. The good news is it only takes a few good daily habits to make a positive impact. 1) Walk 30 Minutes a day - morning, noon or night commit to a quick stroll outside for a healthy serving of fresh air, mood boosting endorphins and calorie burning aerobic activity. Take your four legged friend, meet up with a buddy, or just take yourself out for some leg stretching and deep breathing. 2) Practice being mindful. Slow down and truly enjoy your daily moments. Appreciate your beautiful surroundings and give thanks to all the people in your life who support and love you. Greet new people with openness and spread "Christmas" spirit. You will feel nourished and calm in your heart and soul. 3) Drink Extra Water - to flush toxins, maintain hydration, help keep you feeling full and prevent you from drinking extra calories through alcohol and eggnog. For every cup of coffee have a glass of water, or with every glass of wine follow with a glass of water, hot chocolate with a big glass of water. Instead of a snack between meals, drink a glass of water. Your skin and waistline will thank you! 4) Stretch - Ahhh, that feels good! Do it standing up or lying down, once a day for 10 minutes or throughout your day in sweet little interludes of shoulder rolling or foot on the bench hamstring stretching or side bending..... Keep your tissue supple, your fascia pliable and your joints happy. 5) Limit your "treats" and know your limits. It's no use trying to have willpower of steel at this time of year. Who is ever successful?? Better to allow yourself to enjoy a few delicious bites of something you really want and then be sure to get enough vegetables and fiber and quality protein, water and movement to balance you out. Think full day scorecard versus one meal/event. A win-win is possible. 6) Remember you Spine! Want to look great in that Christmas party dress or family photo? Posture Perfect with your shoulders back, tall spine, head balanced, abdominals in and body poised. Good posture looks amazing on every body! Lengthen up, engage your core and you will look and feel 5 lbs lighter. 7) Reserve your 2019 Pilates Program!! The best way to get on a schedule of fitness and movement is to have it already in your calendar. See the Jan/February Schedule at Pilates Function and reserve your spot now for your post holiday core strengthening, spine lengthening, joint moving, calorie burning, full body intensity exercise program. Space is limited so register early. Happy New Year! In standing posture bring your head and ears back over your shoulders, balance the rib cage on top of (not in front) the pelvis, balance the hips level and straight (not tipped forward, tucked under, twisted or hiked up on one side) and stand with parallel legs, neutral knees (not hyper-extended), and your weight equal over the 4 corners of the feet. There is a lot that can go askew here but correcting faulty posture is KEY to decreasing compression and shearing of the joints, muscle tension, fascial dysfunction and pain. Practice a lateral and posterior breathe pattern; breathing into the lowest lobes of the lungs and wide to the sides of the rib cage. Avoid pushing or bulging the belly outward. Use a controlled exhalation to assist in gently drawing in, or "gathering in" the deep “navel center”. Lift the pelvic floor upwards and gather the deepest abdominals in like a corset, slightly tightening around the lower belly. As described above; the pelvic floor, inner most abdominal layer called the transversus abdominus, plus the deep spinal stabilizers called the multifdus, make up the core or the "inner unit" of postural muscles. Learning to engage these inner muscles to stabilize and support your pelvis, hips and low back leads to decreased back pain, better hip function and improved posture. Have a system of checkpoints and think often about your posture. Become aware of your habits so you can work to re-align and re-balance your joints. The brain controls all of these systems so when you improve your awareness you can more easily improve your balance, strength, and movement patterns. Start with the brain, breathe deeply, engage the inner unit/core and move mindfully. Register now to hold your space in a PF Fall Program - they start September 5, 2018! 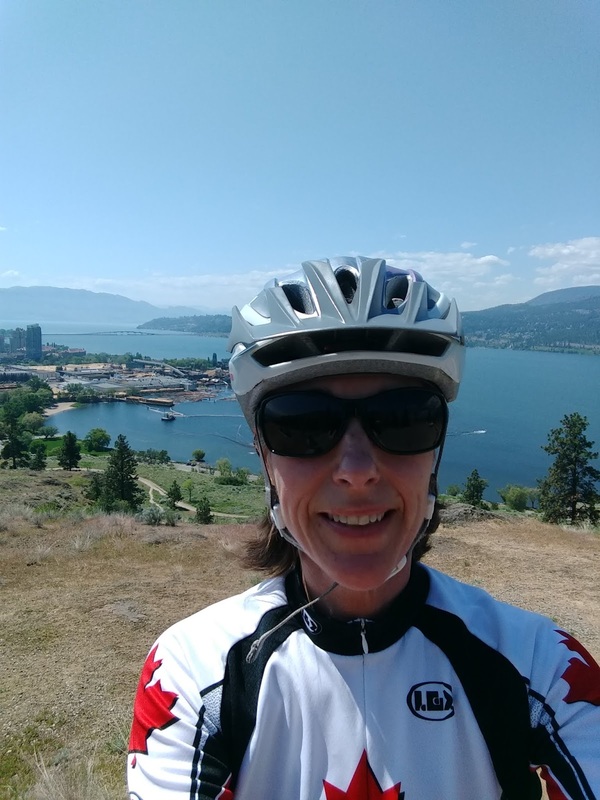 With the heat and long days of summer comes a chance to both relax and be active in the beautiful Okanagan Valley. Nature calls to us with all her bounty plus there is enough time to connect with old friends and family. 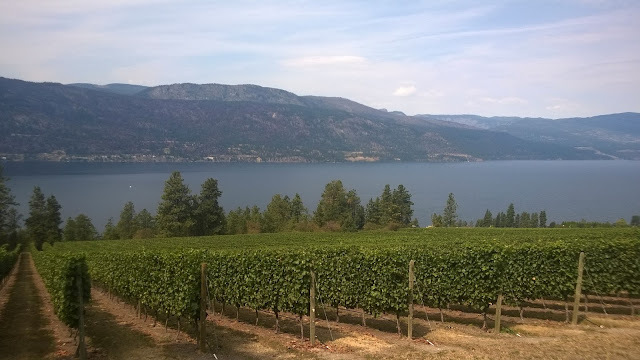 Kids are out of school, back yard BBQ's and reunions are in full swing, the gardens are blossoming and the lake, golf courses and hills are calling for you to come out and PLAY! Oh Summer! The studio's schedule is slightly reduced to reflect that intention and I am delighted that the classes running this summer are full. I am grateful to all the students who will be spending part of their summer with me working on improving their posture, core strength, mobility and balance. With good function you can do all you want to do! Stay tuned for New Fall class offerings. If you want to be "on the list" please email me and let me know as space is limited. Also if there is a class or time slot you would like to see offered in September feel free to share that with me too. I am still accepting bookings for private lessons, duet or private group training should you wish to start your Pilates Program now. No time like the present to get stronger and more balanced throughout your body. Pilates for golfers is golden! I wish you an active, healthy AND restful balance to this summer season. Remember to be sun smart, drink tons of water, have fun with friends, and stop and smell the roses. Much love to Mother Nature, she is perfection at this time of year. As creatures of this earth we are deeply connected to the rhythms and pulses of Mother Nature. We nest and rest when it's dark and cold, then reawaken and yearn to move when Spring returns and the days are longer and warmer. This is the time of year to stretch fully, yawn deeply and reconnect to your physical side as you come out of winter hibernation, smelling the air and hearing your body's request to move again. It's time to open, strengthen, elongate, and expand your physical potential. Movement and physical activity can come in all shapes and styles. Why limit what you do in yours to only one or a few? If you have a small movement vocabulary defined mostly by ABC of sitting, walking and lifting, your movement potential is shrinking rather than flourishing and your physicality will start to limit what you can and cannot do. Without a variety of movement patterns our fascia becomes brittle, our joints stiffen, our muscles weaken and our hearts and lungs get sluggish. Not to mention life gets boring! Our bodies are designed to MOVE and to move in ALL directions and patterns; linear, circular, rotational, diagonal, extending and flexing, all with coordination, control and balance. Such an amazing and beautiful thing is your body! And when we move mindfully, incorporate variety, deepen our breath and build body awareness we ultimately become healthier, happier and more balanced. I encourage you to try something NEW this Spring to expand your movement alphabet and appreciate your physical self more. It really is as simple as that. MOVE your body. DO something. Anything really, but best if it is something NEW to you tissue and mind. Always thought of taking a dance class? - do it! Join a soccer league? - fun! Practice yoga? - blissful! Last fall I bought a Stand Up Paddle (SUP) Board and can't wait to use it! Welcome 2017! From coastal city to Okanagan Valley, Pilates Function has moved to BC's very own wine belt, the beautiful 4 seasons playground of Kelowna BC! The last few months of 2016 brought its fair share of change and challenge to me. A BIG birthday was celebrated afar on the top of an incredible mountain, followed by a big move to a new but familiar town, close to family but where new clients and friends and contacts will need to be made. I have said farewell to some very dear people and I am starting over - again. Although this won't be an easy process I am confident that what I can offer of myself as an experienced and caring teacher of Pilates to a new environment and to new faces will ultimately bring great joy and new gifts to my life. And speaking of change - the body needs it! In order to adapt and stay strong, to grow new cells and to heal, the body needs movement - all kinds of movement to re-balance and re-activate underused joints and muscles. Pilates is an ingenious exercise program because it moves all the bodies joints through full ranges of motion to support joint health, circulation, mobility and balance of muscles. Pilates also challenges and changes our awareness of ourselves and our movement habits. By thinking about what we are doing and how we are doing it Pilates exercises can replace poor habits with new mindful patterns that encourage stability, strength and ease. This brain body connection is key to the success of the work as these new neural pathways become the roads for sending information to underused muscles. It is said we become what we think about. When we pay attention to our posture, movement patterns and core support we can change our body and improve our health and happiness. I hope you will join me this year to invite change to your body through Pilates. 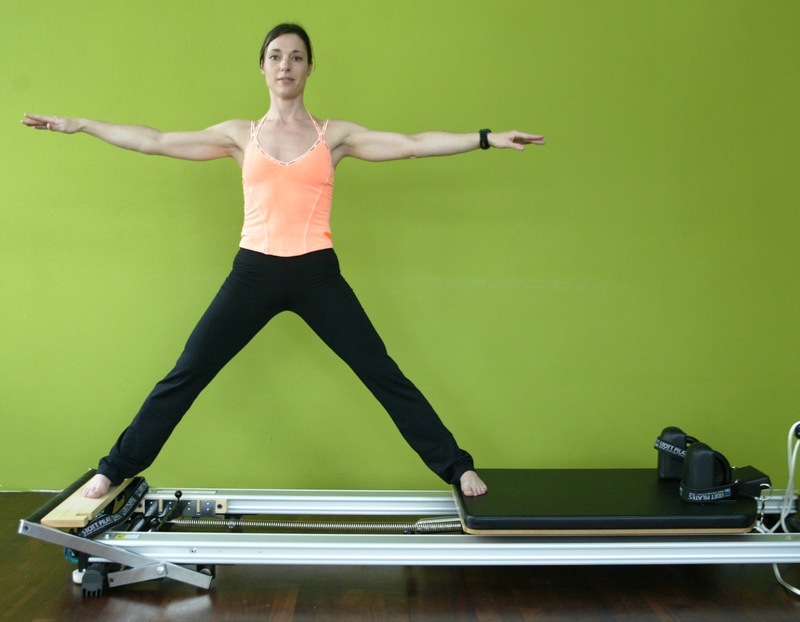 Increase your movement diet with new exercises, try the amazing Pilates equipment (reformer) to support and challenge your muscles with spring resistance and smooth, fluid movement patterns. Change your breathing, change your posture, change your walk. These things will lead to better vigour and health so you can enjoy all the gifts and opportunities of this coming year and beyond. Change can be a very good thing when it introduces the balance we are craving and brings attention back to the needs of our body, mind and spirit. Happy New Year and Welcome Winter 2016!! What an exciting and beautiful time of year. 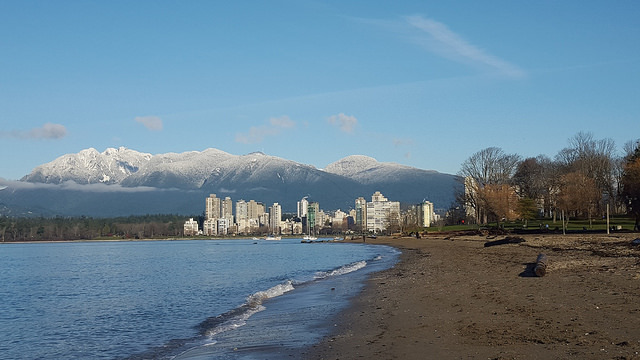 Here in Vancouver we get to enjoy the splendor of the snow covered North Shore Mountains shining down on a sparkling city, green parks and clear blue water. Just stunning! This view begs us to get outside and play like children; with rosy cheeks and wool mittens, fully appreciating nature with a sense of awe, freedom and happiness, moving and breathing in the fresh, crisp, rejuvenating winter air. It’s time to shed the boredom of last November and the fat and sugar fueled indulgences of Christmas with the promise of a New Year and a new exciting season. Only Winter can offer us the invigoration and excitement of our favorite activities requiring ice and snow. Downhill skiing, snow-shoeing, snowboarding, ski-touring, winter running, outdoor skating & hockey, cross country skiing daytime or at night under the lights and stars! Whichever way you choose to enjoy it Winter will reward you and your body with plenty of lung power, leg burn, clear headed focus, personal achievement and a lot of joy! Ah autumn. I love this time of year. The change of colors, softness of light, freshness in the air and the feeling like a long exhale after a busy summer. Can you touch your toes comfortably? Is your pelvis tucked under and your buttocks and low spine flattened? Can you stretch you knees straight when standing and walking? When my clients explain their low back pain to me it is usually described as a nagging, broad, encompassing pain running across the back of their pelvis and sometimes includes tingling and numbing sensations through the buttocks and down the back of a leg. I firstly advise them to consult with their doctor, and then I probe to learn more about recent activities, injuries or overload that may have occurred. Ruling out anything much more serious, it is often the case that a postural imbalance and weak core is largely contributing to the problem. Forward Tilt….This is when the pelvis is tipped too far forward (anterior) at the hip joint, which then pulls more curve (lordosis) into the lumbar spine, tightening the quadratus lumborum muscles across the low back, shortening the hip flexor muscles, and weakening all the abdominals. Try Cat Stretch, Hip Roll, and Thigh Stretch exercises to gently lengthen and stretch the chronically short tight low back and hip muscles, plus Low Ab Curl, Rolling Like a Ball, & Bridge to help strengthen the core and glutes. Tucked Under…..This is when the pelvis is rolled too far back (posterior) at the hip joint, held in a “tail tucked” position which flattens out the natural curve of the low spine, tightening the hamstrings and weakening the core. Exercises that maintain the pelvis in a neutral position while stabilizing with the deep core muscles (transversus abs, pelvic floor, multifidi) and moving at the hip are recommended. Try Supine Heel Slides & Toe Taps, 4 Point Knee Lift Off and Standing 1/2 Squat, plus Side Leg Lift Series and Hamstring Stretches are also recommended to strengthen the hips and lengthen the tight back line. Just Right …. Tilting and tucking of the pelvis both cause joint compression, core disconnect and poor movement patterns. Learning to stabilize the pelvis in its neutral position brings access to better core control, hip mobility and a healthier low back. Practice standing, walking and sitting with the pelvic bowl level and balanced over your legs. 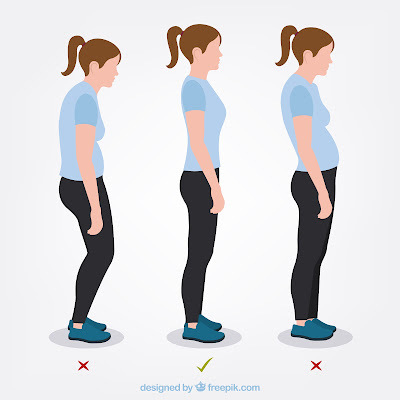 Allow your sitting bones to “move away” from one another rather than holding the buttocks tight, and think of gently drawing your low belly wall and pelvic floor muscles upward and in as you breathe deeply, creating a corset of core support around your center. Feel supported, stable and balanced around the middle, then grow the spine tall. Just right! If you have any questions about this article or would like any of the above exercises described to you in more detail, please feel free to email me at janine@pilatesfunction.com.